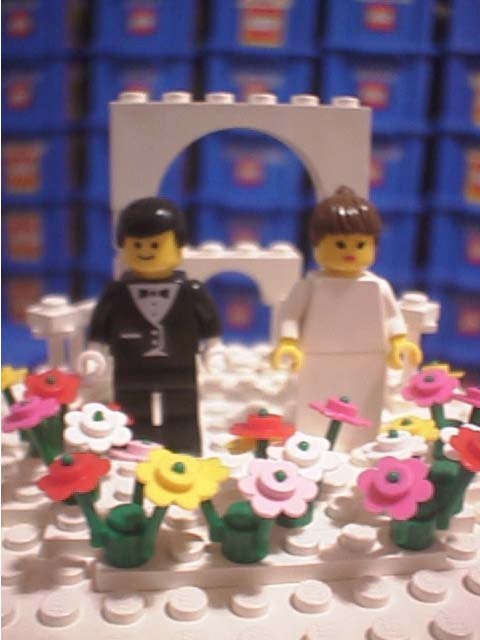 I am not currently building any LEGO wedding items for sale. This is a project that has quite a history and had been kicking around in my mind for some time. I was prompted to finally build a LEGO wedding cake mainly because I got a surprisingly high number of inquiries about LEGO wedding-themed items during the past year. I had built a Bride and Groom for one individual (this was not my original design, it was sent to me as a single digital picture, and I reconstructed it). Other people had also sent various emails to me because either they were getting married or they had friends who were getting married and someone involved was a big fan of LEGO. 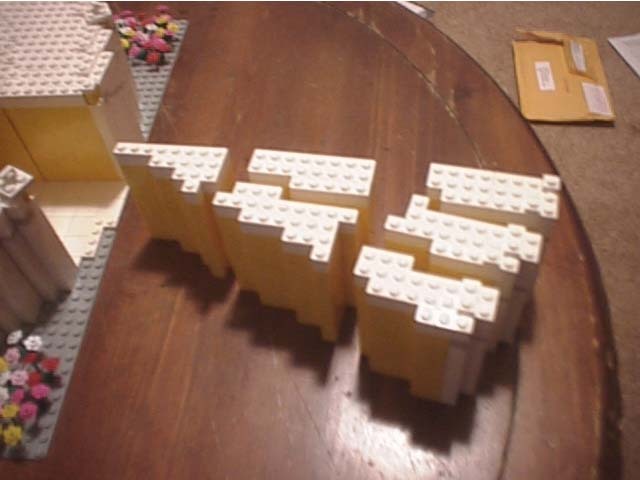 I had actually designed plans of construction for a large LEGO cake over a year ago, but it had never been fully built. 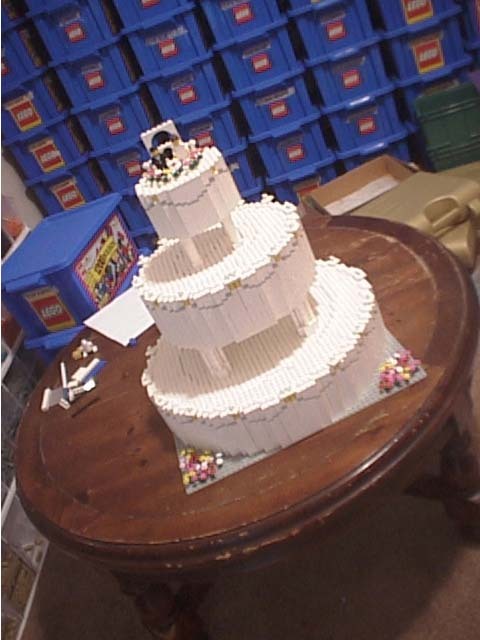 With the apparent interest in wedding related LEGO models, I decided to go ahead and build such a cake so that the next time someone asks for something, I'll have completed this and can reply, "if you want this, I can ship it immediately". I went with a pretty classic design for the cake (not that I am, by any means, an expert of wedding cakes). It has three tiers. While superficially it appears to be all white, the majority of the model is actually yellow. This is because I designed the cake so that it could be disassembled into pieces (or 'slices') of cake... and the cake is yellow with white icing. 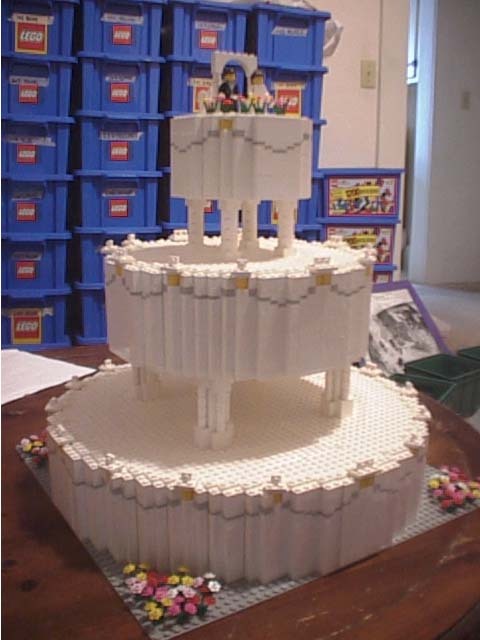 The idea is that the bottom two tiers of the cake are comprised of 124 slices of LEGO cake. 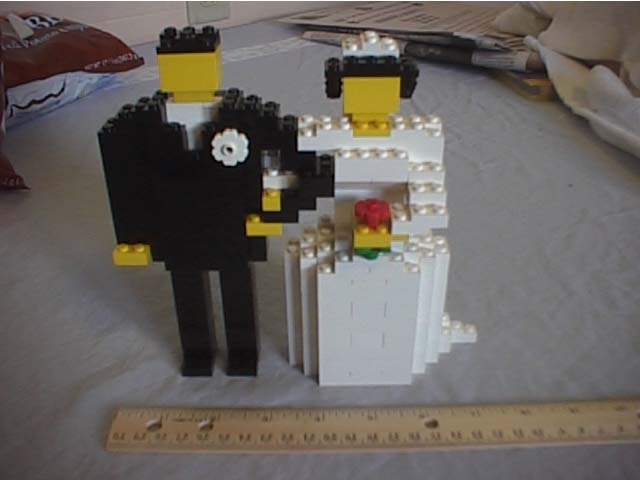 These slices, while obviously not edible, could be distributed to guests of the bride and groom as souvenirs... everyone would get their own little LEGO memento of the happy day. The top tier (the smallest one), has a bride and groom mini-figure display and does not deconstruct... it would be a single piece that would be kept by the newlyweds. The building of the cake went pretty much according to plan. Man, did it use a bunch of small pieces. 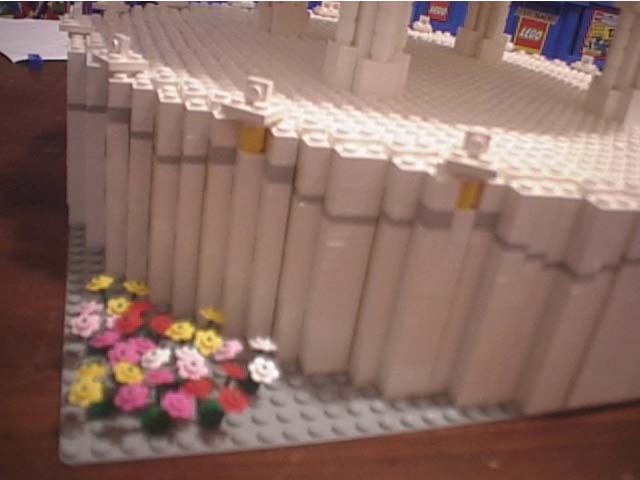 In order to use up some of my many lesser sized bricks I tried to use as many 1x2s and such as possible. 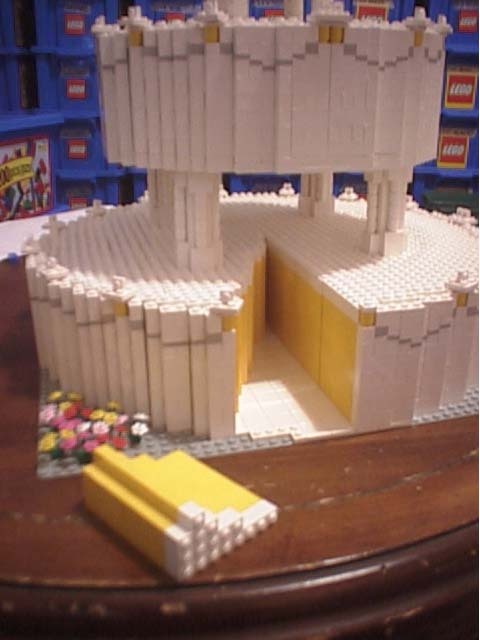 In the end I think I used about 3,000 yellow 1x2s as well as many other sizes in both yellow and white. And, boy, does that make a *heavy* cake. This thing is SOLID. 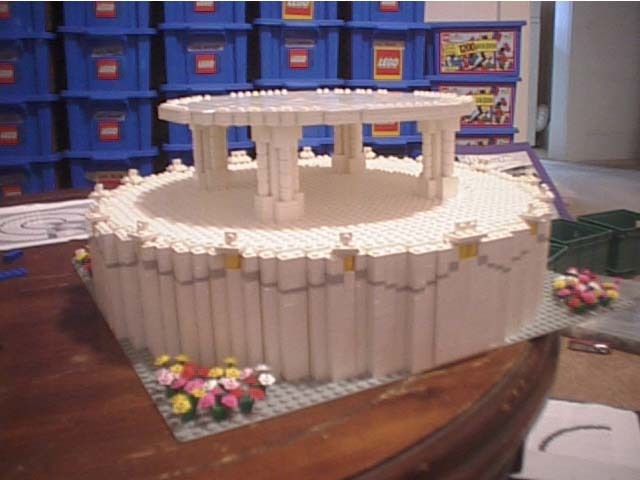 The bottom tier is 48 studs in diameter (15 inches), the second tier 32 studs, and the top pieces 16 studs. 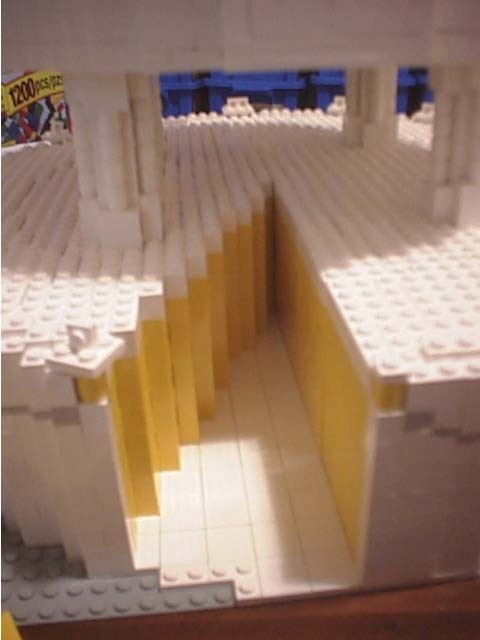 Underneath the largest tier is a large gray base plate outfitted with plenty of 2x2 white smooth tiles. 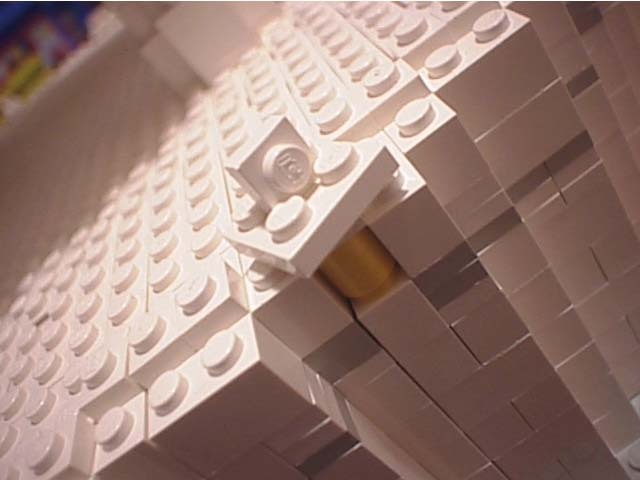 The edges of the 'plate' have a few white plates (with studs), and these act to hold the outer 'ring' of slices in place. A similar scheme was used on a platform holding the second tier of slices. A smaller version of the cake; just the upper two tiers. Obviously less expensive. Just a cake topper that sits atop a more traditional (edible) cake. Here is a 'mega-figure' (x8 scale) of a groom -- ready to stand next to a wedding cake. Who knew so many lovebirds also loved LEGO? Final touches were added such as the light gray decoration around the edge of the cake and white plates along the edge of the top of the two large tiers. The mini-fig bride and groom atop the cake. Four different colors of flowers also decorate the cake: red, pink, yellow, and white. 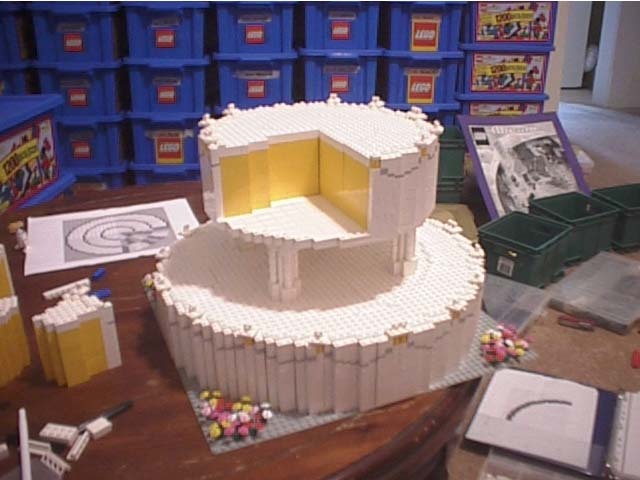 A view of the bottom tier with six 'slices' removed. The resulting wedge allows one to see the yellow cake within. Another view of the cake with slices removed. Here are the six slices that were removed. One can see how they fill the wedge space. The complete cake stands fully constructed. The cake stands about 16 inches tall when fully assembled. A close-up of some of the white plates decorating the edges. Numerous flowers were also used to decorate as well as small light gray 1x1 plates around the cake's exterior. This shot shows the second tier being added, slice by slice. Another shot of the second tier. 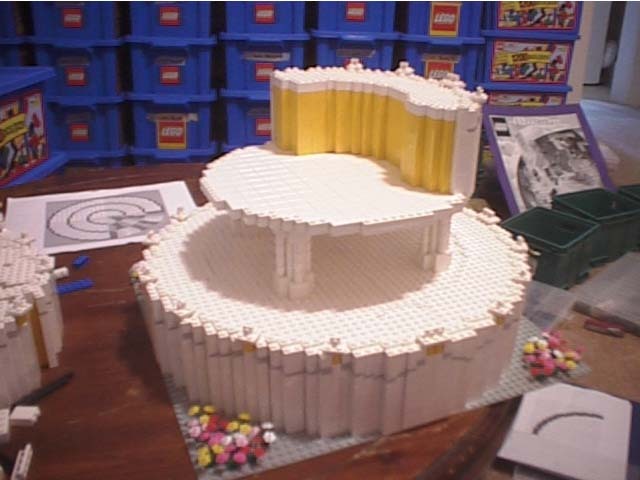 The bottom tier and the second tier platform before any more pieces are added. A final shot of the completed cake. Birthday Cakes are also available if that's your celebration.